For the third national election in a row, independent voters may be poised to vote out the party in power. The Republican Party holds a significant edge in preferences for the upcoming congressional election among likely voters, in large part because political independents now favor Republican candidates by about as large a margin as they backed Barack Obama in 2008 and congressional Democratic candidates four years ago. The survey by the Pew Research Center for the People & the Press was conducted Aug. 25-Sept. 6 among 2,816 registered voters, including 2,053 voters considered the most likely to vote on Nov. 2. The survey finds that 50% of likely voters say they will vote for the Republican in their district, while 43% favor the Democratic candidate. Republican and Democratic voters overwhelmingly support their party’s candidates. The GOP’s advantage comes as a result of their 49% to 36% lead among independent and other non-partisan voters who are likely to vote in November. The Republican Party’s overall lead is only evident when the sample is narrowed to likely voters. Among all registered voters, preferences are evenly divided. 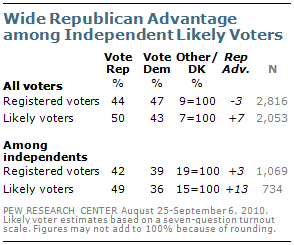 The race also is even among all independents and other non-partisans, but the GOP’s advantage swells to 13 points among independent likely voters. Uncharacteristically, independent voters, who typically are not highly engaged by midterm elections, are now more likely than Democrats to say they are giving a lot of thought to this one. And they are about as likely as Democrats to say they definitely will vote; during the fall of 2006, far more Democrats than independents said they definitely would vote. The relatively high level of independent engagement this year has come among those who plan to vote Republican. Fully 64% of independents who plan to vote for the Republican in their district are giving a lot of thought to the election, compared with just 40% of independents who plan to vote for a Democrat. Independents’ voting preferences have changed considerably since the last two elections. Just two years ago, Obama held an eight-point lead among independents, according to exit polls by the National Election Pool. The shift since the 2006 midterm, when Democrats held an 18-point advantage among independents, according to the exit poll, has been even more dramatic. The propensity of independents to reject both parties in a relatively short period of time may in part reflect the fact that the ranks of independents have swelled in recent years with voters who have rejected party labels themselves. Underscoring the fluidity in party identification, many of today’s independents were themselves partisans not so long ago. More than half of independents say they have been a Democrat (23%), a Republican (22%), or both (9%), in the past five years. 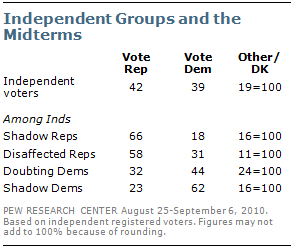 Independents are the largest group of voters – 37% of registered voters are independents or other non-partisans, 34% are Democrats and 29% are Republicans. Just two years ago, 34% were independents, while 38% of voters identified as Democrats and 28% as Republicans. 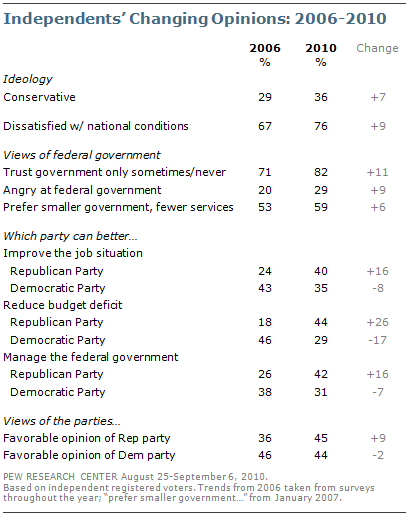 Independents have mixed views of which party can do better on major issues – but are distrustful of both. 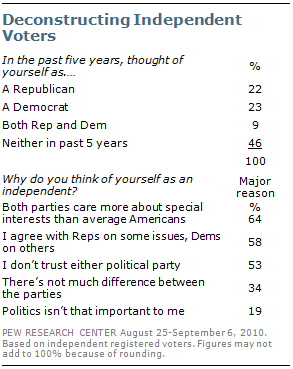 When asked why they are independents, fully 64% cite as a major reason that “both parties care more about special interests than about average Americans.” And 53% point to a lack of trust in either party as a major reason they think of themselves as an independent in politics. While the survey finds indications that independents will vote Republican this year, they do not have a strong allegiance to the GOP. Rather, they are motivated by highly negative feelings about the government’s performance and harsh judgments about the political status quo. Just 35% express approval of their own congressional representative, and they are as likely as Republicans to say that their own incumbent does not deserve reelection. But unlike Republicans and Democrats, a majority of independents say that which party controls Congress will not be a factor in their vote. By 44% to 29%, more independent voters say the Republican Party rather than the Democratic Party can better reduce the budget deficit; the GOP also now leads by a 42% to 31% margin among independent voters as better able to manage the federal government. Yet far more independents (49%) say the Democratic Party “is more concerned with the needs of people like me” than say that about the GOP (32%). And on the important dimension of which party can bring about the changes the country needs, as many prefer the Democratic Party (37%) as the Republican Party (36%). When asked which party comes closer to their views on major issues, independent voters prefer Republicans on foreign policy and economic issues but are more divided on social issues. More say the Republican Party comes closer to their views on foreign policy and national security (by 44% to 30%), but the GOP’s lead is more modest on economic issues (43% to 34%). And slightly more independents say the Democratic Party (39%) rather than the Republican Party (33%) better reflects their views on social issues such as gay marriage and abortion. In this regard, more than twice as many independent voters than Republican voters favor allowing gays and lesbians to marry legally (45% vs. 20%). All things considered, support for the Republicans and political energy among independents is closely linked to disillusionment with Obama’s policies and the president himself. Fully 69% of independent voters who say Obama’s policies have made the economy worse favor the Republican candidate in their district – and 80% say they will definitely vote. Disapproval of the president’s job performance, anger at the federal government and opposition to the health care legislation also are closely associated with support for Republican candidates. Independents who express these views also are highly likely to vote. Conversely, support for Obama and his policies is strongly associated with independents’ support for Democratic candidates; in fact, 73% of independents who say Obama’s policies have improved the economy plan to vote Democratic. But far fewer of those who express this opinion say they will definitely vote compared with independents who take a negative view of the impact of Obama’s policies (63% vs. 80%). vote in November, which is about the same as among GOP partisans (83%). As many Shadow Republicans as Republican voters agree with the Tea Party. But they have mixed opinions of the Republican Party – just 52% have a favorable view of the GOP. Disaffecteds (16% of independent voters) have been hard hit by the recession and are highly financially stressed. Anti-government and anti-politician, these quick to anger blue-collar voters have been mainstays of Pew Research typology groupings for decades. Disaffecteds divided their votes between Obama and McCain in 2008; today, 50% of Disaffecteds say Obama’s policies have made the economy worse and 60% disapprove of the health care bill enacted earlier this year. Shadow Democrats (21% of independent voters) hold positive views of government and are not very critical of the political system. They support Obama and his policies, and have very positive views of the Democratic Party. Shadow Democrats are younger than other independent groups and are racially and ethnically diverse – a quarter are black or Hispanic. Shadow Democrats support Democratic candidates by as large a margin as the two GOP-leaning groups favor Republican candidates. Doubting Democrats (20% of independent voters) are not especially anti-government, but they are deeply anti-business and are highly critical of elected officials and both political parties. In many respects, they are as cynical as the Disaffecteds. Doubting Democrats are less affluent and less racially and ethnically diverse than are Shadow Democrats. While they voted for Obama over McCain by a wide margin, they are now critical of Obama and the Democratic Party. Just 23% of Doubting Democrats say Obama’s policies have made economic conditions better – only about half the proportion of Shadow Democrats and Democratic voters (50% each). As many Doubting Democrats say the Republican Party can better reduce the deficit as say the Democratic Party. There also is a fifth group of independent voters, the Disengaged (17% of independent voters), which is disproportionately made up of younger and less educated people. For the most part, the Disengaged are essentially political bystanders –just 21% say they definitely will vote this fall, far and away the lowest percentage among the independent groups. Independents today are clearly more conservative than they were four years ago, particularly with respect to the role of government. Not only do more describe themselves as conservative, but more support smaller government, and there is more distrust and anger toward government generally. While this ideological tide among independents benefits the GOP, there is a broader rejection of the party in power that also is influencing independent support for Republican candidates. Given their detachment from the parties and general skepticism about politics, independents’ views of president’s and the parties’ performance can and do change quickly. In this regard, the independent swing toward the GOP in 2010 has as much, if not more, to do with views of performance than with shifting ideological preferences. Currently, independent voters rate the parties about evenly when it comes to which one could better improve the job situation (40% Republican Party, 35% Democratic Party). Four years ago, the Democrats led by 19 points (43% to 24%) as the party better able to improve the job situation. 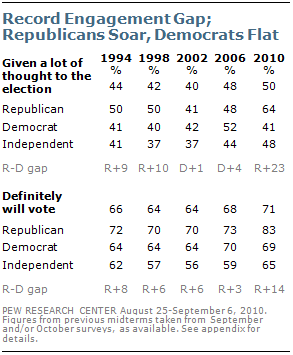 Independents views of which party can better reduce the deficit have flipped since 2006 – the Republican Party is now favored by 15 points; in 2006, the Democrats led by 28 points. On perhaps the most important measure of performance – managing the government — more independent voters currently now say the Republican Party could do better, by 42% to 31%. In 2006, by about the same margin (38% to 26%), more independent voters said the Democratic Party could better manage the federal government. The Republican Party now gets about the same favorable rating among independent voters as does the Democratic Party (45% vs. 44%). Four years ago, 46% of independent voters viewed the Democratic Party favorably compared with just 36% who had a favorable opinion of the GOP. More generally, independent voters are even more dissatisfied with national conditions than they were in 2006. Fully 76% of independent voters say they are not satisfied with the way things are going in the country, up from 67% four years ago. About as many registered voters say they agree with the Tea Party movement as disagree (29% vs. 26%). Independent voters are more likely to say they agree with the Tea Party movement than disagree (by 30% to 22%). Among likely voters, more agree than disagree with the Tea Party (36% vs. 29%). 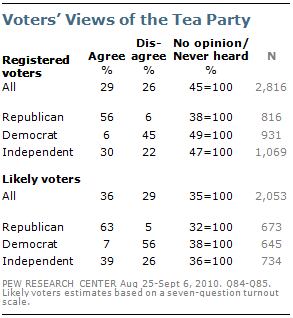 And among independent likely voters, 39% agree with the Tea Party, compared with 26% who disagree. The proportion of independent voters or non-partisans is now at 37%, one of the highest levels in the past 20 years of Pew Research Center polling. 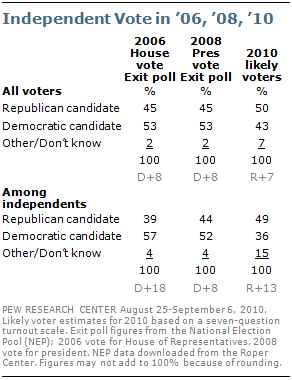 The share of independent voters has grown from 34% of registered voters in 2008. The Democratic Party’s advantage in party identification among registered voters has narrowed from a 10-point gap last year to a five-point gap in 2010 as Democrats have lost adherents and the Republican Party has gained supporters. There has been little change in voting intentions over the course of the year. Registered voters have been closely divided in their preferences, while Republicans have enjoyed an advantage among voters most likely to cast a ballot in November. As in previous midterms, older independents are more likely to vote Republican than are voters younger than 50, and independent men are much more inclined to cast a GOP ballot than they were four years ago. Obama’s job approval rating among independent voters stands at just 39%; 50% disapprove of the president’s job performance. 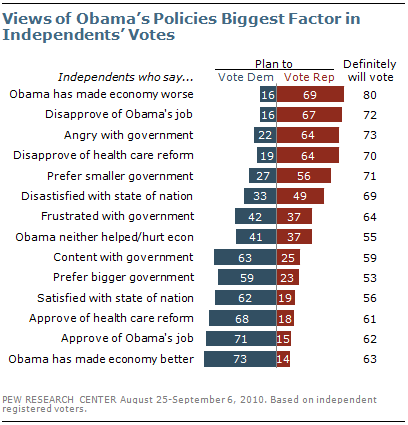 Still, Obama’s rating among independent voters is higher George W. Bush’s in September 2006 (29% approve/57% disapprove).